Near the Pisgah National Forest of Newland, North Carolina, are the Linville Falls and their namesake winery, both of which we visited on this beautiful day of our summer vacation. The state maintains well-traveled—and well-groomed—hiking trails that must bring thousands of visitors to the Falls each year; far fewer visit the winery I’m sure. It was not just the road signs that brought us to the Winery but also this picturesque hillside. Rows of grapes stretching sunward, a pond shimmering off in this distance through the heat, and clouds so low and tumbling that you can almost pull them down from the sky. Yes, those are Christmas trees growing proudly all across the beautifully landscaped hills. The bar in the Winery tasting room was packed, and we opted neither to wait for open seats nor uncork on the festive outdoor patio (too hot) but rather grab a bottle of this American Syrah and head back to our waiting pup and the peace and quiet of our mountain cabin rental. 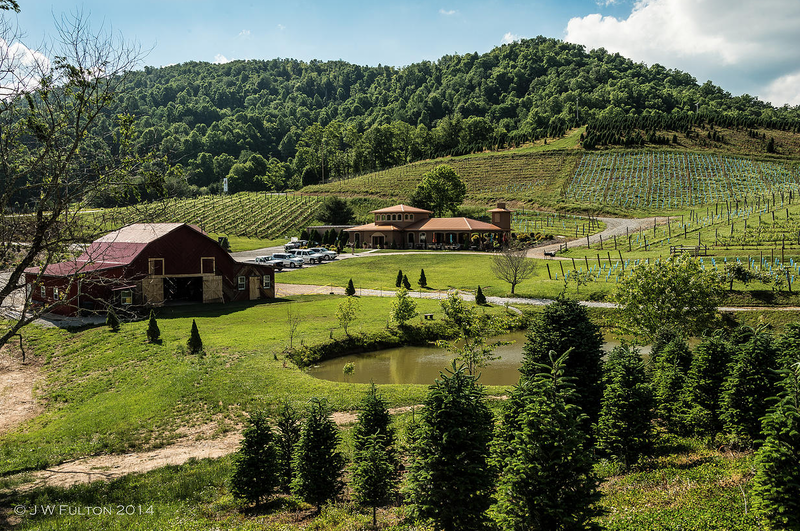 The hostess at the Linville Falls Winery complimented our choice and mentioned that the wine had fared well in competition at last year’s North Carolina State Fair. I missed what she said about the Syrah’s performance, but did enough research to see that over 1 million visitors hit the fair yearly, so it’s no small event. I wrestled that evening whether to open the Syrah in the spirit of our Linville Falls hike or the Aristocrat and ultimately saved this smooth, uncomplicated red for home. 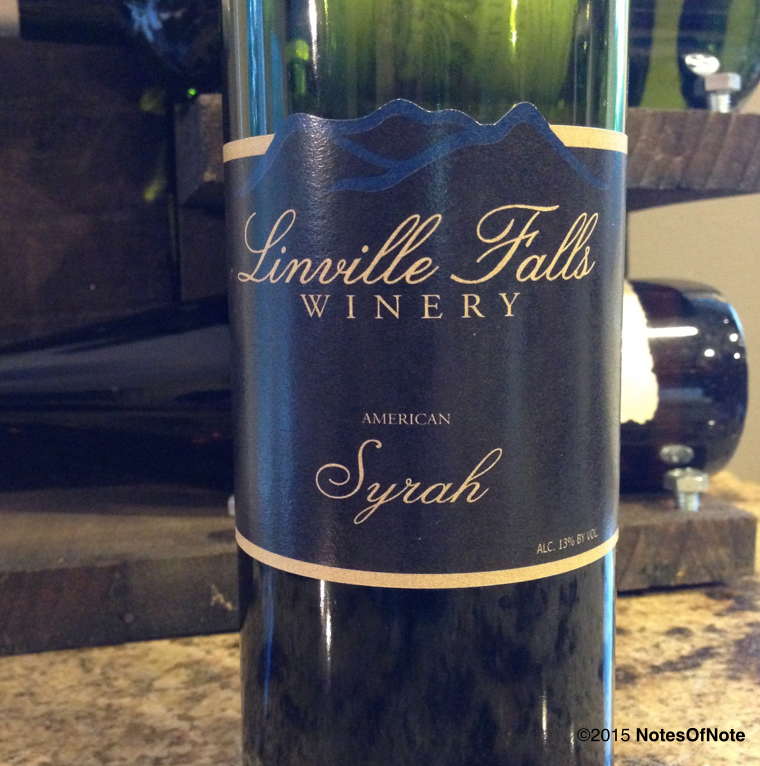 2013 American Syrah, Linville Falls Winery, Newland, North Carolina, USA. That was a good idea, as we got to enjoy a great red on that evening and save the Syrah and the Falls memories it engendered for another night. That said, I have to think carefully about this vintage of the American Syrah. It’s notably different than other Syrah’s we’ve pulled recently; it’s smooth and uncomplicated, and has far less of the spice box or peppery accents that you often taste in a Syrah. Is it intentionally mild, or is the lack of these nuances indicative instead of a “local” winery fighting for legitimacy? The smell of the Linville is similarly even, its color a brick red that’s somewhere between a Pinot Noir and Cabernet or Malbec. The finish of this Syrah is mild and smooth all the way down. Last night the Falls accompanied grilled steak; tonight it went with salmon accented with a slather of fresh cut peppers, capers, and jalapeno jelly. I don’t think the Syrah drew out any specific flavors with either meal but was a relaxing adult beverage nevertheless. I’d enjoy the American Syrah again in the future, not as much for its complexities or lock-down flavor but more because of the amazing vacation trip it commemorates. This entry was posted in Syrah and tagged $20-$25, North Carolina, USA.